Tomorrow, I am flying to Lagos, Nigeria. I have been invited to participate in a culture and business event arranged by the embassies of the Nordic countries. I will exhibit pictures of the Easter celebrations among the Saami of Kautokeino, Norway. No doubt the Nigerians will find the winter landscape and the colorful Saami very exotic. Some of the images are from the Rites of Life project, but I will also show other photographs, for example one that I took shortly after the Easter celebrations, when I accompanied my hostess Karen Utsi on a trip by reindeer sled across the Finnmarksvidda plateau. We were moving some reindeer to the main herd in time for the spring migration. 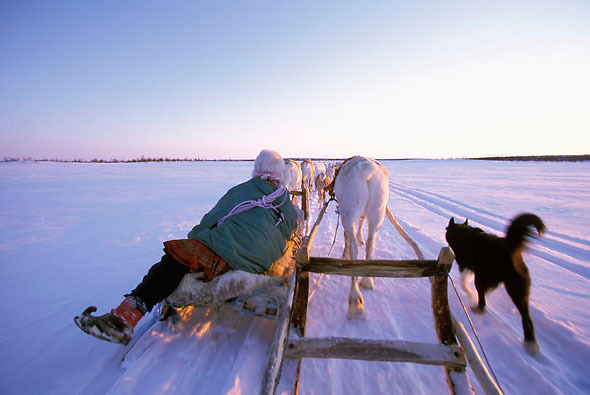 What a fabulous experience to be traveling in this slow, age-old manner across the snow-covered tundra. But when returning to Kautokeino we instead traveled fast by snowmobile, and the same distance that had taken two days by reindeer sled now took slightly less than three hours, a very good illustration as to why the snowmobile has revolutionized life for the Saami.